When iPad apps mimic the world of paper, they like to add the extra bits that surround the paper too. Notepad apps have graphics that look like tear perforations. There is binder rings or stitching holding the pages of paper in place. It’s fun to have the extra graphics that remind us of the paper we have used for so many years. Fun graphics does mean less room to write and draw though. Along with those fun graphics is tool bars and navigation buttons… they take up valuable screen space too. 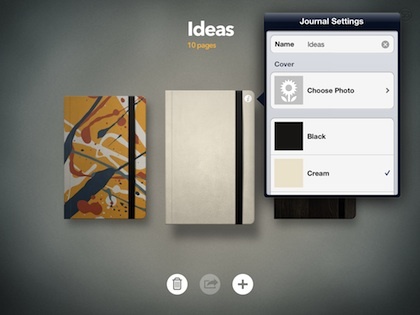 There is an app that is challenging the current line of notebook app thinking. The free app, Paper, is all about working with a clean piece of paper. With the exception of the ‘paper’ being grouped into notebooks, there is no ‘fun’ graphics taking screen space away from your experience. 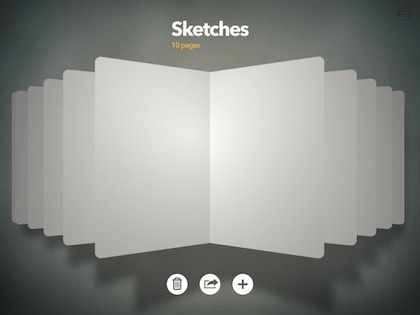 The notebooks are arranged side-by-side in an overview screen that you can sweep through. The art on the face of your notebooks (you can use your own photos too) and the naming of the notebooks is customizable. Tap a notebook to open it. Paper presents it’s pages like a accordion folded long piece of paper that you flip through rather than turning pages like a book. 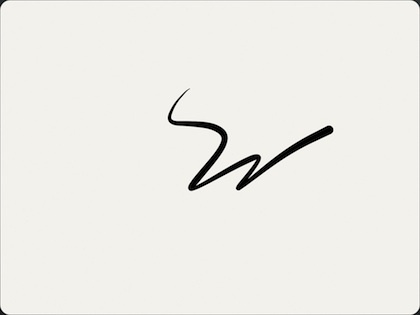 The free Paper app is a very nice tool to use if you are looking for a electronic pen on a plain white piece of paper… paper just like you grab out of the copier when all you want to do it draw a quick sketch. The app has gotten a LOT of complaints though as the free version one pen, an eraser and a small group of color inks. Each of the other pens/brushes will set you back an additional $1.99 US. The problem is only a perspective problem. 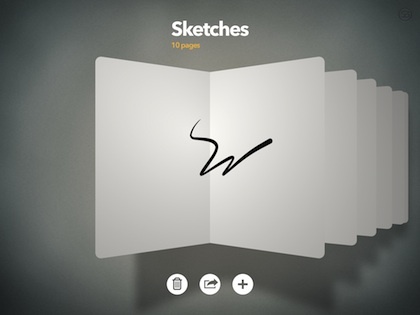 Think of the Paper app as a ‘lite’ version that you can test for free. Explore the power of a full screen of white paper, a pen and colors of ink. If you want the full version with more pen/brushes, you upgrade. Drawing and writing on the screen is very smooth. Paper adjusts the electronic ink lines width depending on the speed of your finger/stylus. The effect helps enhance simple drawings. Two fingers sweeping in a counter clockwise circle will undo you last line. 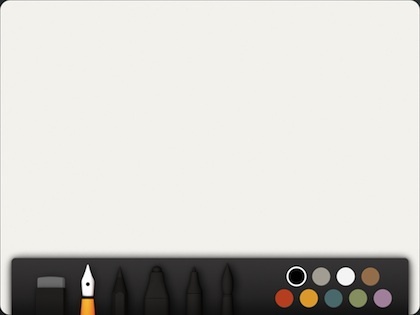 Show/hide the pen/ink palette with a swipe up/down. A two finger squeeze will close the Paper page down to a view of the notebook pages. Sweep your finger across the pages to move through. Another two finger pinch will close the notebook down to the overview of all of your notebooks.